I went to a volunteer orientation in the West Village in the morning. It was such a nice day that I figured I would wander on over to Tompkins Square Park in the East Village to check out the Howl festival that I had unfortunately slept through the day before. 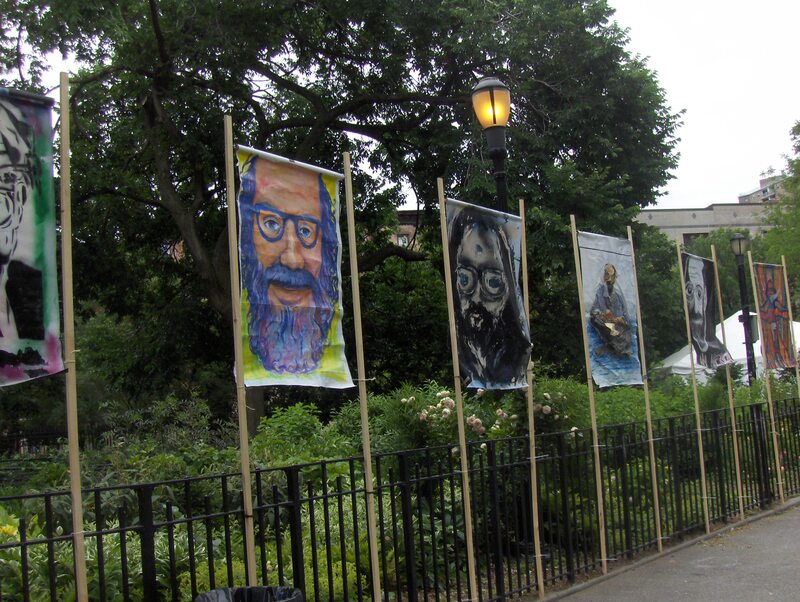 The festival is meant to celebrate the life and work of Allen Ginsburg who although associated with the Beat Poets, City Lights, and San Francisco, wrote and performed “Howl” in the Lower East Side. It’s an amazing, epic poem which I hope you, my dear reader, have read through at least once. The first line still gives me chills when I read/hear it. I bought myself a mango juice and got to the park around 11:30. It is a lovely little park with plenty of places to sit and do some quality people watching. There was an area of open grass where they were offering free yoga. I figured, why not? In my jeans and flannel shirt, I borrowed a yoga mat and joined in. It was a perfect day, overcast and breezy, cool enough to do some quality outdoor exercise. I’d always wanted to try yoga and have been reading up on Buddhism on and off for the last year or so. I think the last two years of my life have been very disruptive, and I find myself just wanting some semblance of peace and guidance. I have looked to many things to find it, but (not to sound overly-spiritual) I now know that I have to find it within myself. There were about seven of us doing free yoga in the grass, most of the others obviously had previous experience. I was desperately trying to not fall over most of the time. The man sitting next to me seemed to be in the same boat as me. I think he (like me) was walking by and just had the time to kill. He was one of those fleeting friends you meet in life who you have a quick friendly connection with, but you always part without knowing their name or really who they are. There was one point where we were all rocking our “foot baby” which was easy, relaxing, and really really funny looking. Then our instructor put her foot baby behind her head and propped herself up on one hand and extended a foot out. Me and my fleeting friend instantly looked at each other, laughed, and continued to rock our “foot baby” while whispering things like “Yeah right” and “Not today” to each other. The best part was at the end when we just laid in the grass, relaxing our tired and stretched muscles, focusing on our “intention” and just being present in that park at that moment. An “intention” is the mind’s focus during yoga. Mine was simply serenity. I just wanted to have a clear mind and heart for that hour and a half. It wasn’t easy. At one point the instructor came over and sprinkled something scented on me and touched my face and neck while whispering to me “Just let it go.” It was so new age, but it helped, and I really felt completely at peace for the first time in a very, very long time.